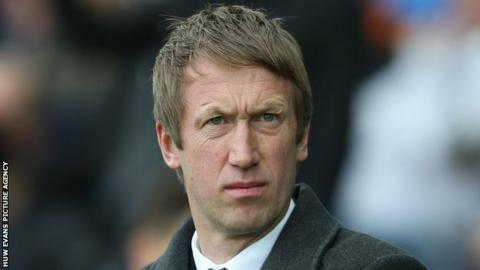 Graham Potter says the likelihood of job losses at Swansea City has affected his players. Swansea issued redundancy letters to all employees aside from manager Potter and his playing staff last week. The Championship club said there would be a "reduction in head count" as they cut costs following relegation from the Premier League. "The players are paid to play football, but we're human beings," Potter said. "The good thing about this club is people like each other, from players to staff to all around. "When you have that of course you are concerned when there are redundancies - it's not pleasant. "Swansea isn't the first place where this has happened, but there is a feeling of concern." Potter's number two Billy Reid as well as assistant coaches Alan Curtis and Bjorn Hamberg are among those who have received redundancy letters. There is no figure on how many jobs will go as Swansea attempt to deal with the major drop in revenue which comes with dropping out of the top flight. "Of course you know it's a worrying, unsettling time for people and it's not ideal, but it's part of what the club has to do in terms of reducing its costs following relegation from the Premier League," Potter added. "What I would say is that everybody is very professional. They get on with their jobs in a fantastic way. We try our best every day to try to help the team win on a Saturday." While they are looking to reduce expenditure, Swansea are ready to hand in-form winger Daniel James a sizeable new contract as they try to protect one of their prize assets. Potter says negotiations are continuing with the 21-year-old, whose current deal is set to expire at the end of the 2019-20 campaign. When asked if he expects the Wales international to sign a new contract, Potter added: "It's up to him and his agents - there are lots of factors. "From my perspective of course I hope so, but I know it's football so we'll see. "He has done really well. Our job is to help him have a career at the top of the game for as long as possible and I'm happy with his progress. "He looks like he is enjoying his football which is great."